a little at a time, consume all in death! It’s from Ovid, from around the period that the Roman town of Aosta was being built. Beautiful lines, but nothing unusual in its sentiments about the doings of time. Time devours, age wears away, and eventually nothing is left of what is built to last for ages. It’s sobering enough to be no longer sobering, because we can’t think in millennia. To me a month spreads out like infinite time when I miss my wife and family, and though I know intellectually how short a stint that is, within its span, feeling it with heart and imagination, it dilates, becomes a small eternity. Even more so the stretch of two thousand years, and Aosta is both marked and undergirded by ruins that old. From the Augustan arch at the eastern end of the central city, the still-dramatic theater closer to where I live, literally down to the tunnels and arcades beneath its medieval and Renaissance street plan, the city is a hive of ghosts. Is there a way of looking at these ruins other than Ovid’s gloomy thoughts about the provisional, the temporary, the way all things must pass? Probably not for any length of time. Thinking otherwise must pass, too, and we are left with the transitory state of things. I do remember, though, the first Roman ruin I saw. It was far from here: an aqueduct in North Wales. I recall marveling that the Welsh narrow-gage train track that once had spanned the top of the structure—probably late in the 19th or early in the 20th century—had fallen to rust and decay, while the aqueduct, though worn and marked by rooted weeds, was still steady and upright. There are degrees, I guess, of permanence. There is a kind of lingering at the gate before you go. It’s basically common knowledge that all great Roman building depends upon the arch. Nor are Aosta’s ruins an exception: the great defining structure of Roman triumph is everywhere, from the Praetorian Gates to the venturesome arches of the theater, through which these days, if the weather is clear, you can easily see the Alps. Which brings me to something about the ruins that I’ve thought about for several days. The arch as support is one thing, but it is also a gateway, a passage. Beneath the Augustan Arch is now a crucifix: the space it covers is now marked by the crucified God, inconceivable to the builders of the emperor’s original monument. And of course the Alps through the arches of the theater, where the whole of nature can behold our little plays through the crumbling things we have made. Both sides of the Praetorian Gate open into narrow, Renaissance city streets, so that the passage through them, in the footsteps of Roman legions, takes you from one beautiful road into another, equally beautiful but pretty much the same. 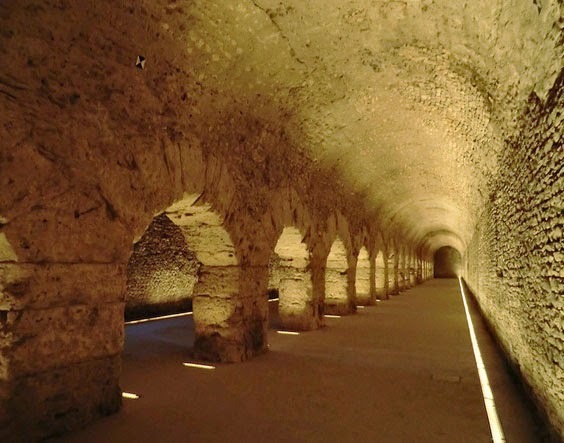 Underground, though, is the cryptoporticus—excavated and restored over the last century—that is the monument to the liminality of these ruins, how they linger to suggest at a ghostly passage that underlies us all. The arcade, as restored, extends for about fifty yards beneath the city, beneath the cathedral, then doubles back on itself, so that the wanderers emerge, like characters in a myth, pretty much at the stairs where they first descended. Pockets of natural light, fractured through boarded windows, let you know that this passage was once ground level: a kind of “cloister walk” that framed the holy space of the Roman forum.